The force applied stretches metal beyond its yield point, but not so much that it cracks or breaks. The automotive, semi-truck manufacturing, off-highway vehicle and military equipment industries use forged products that are made of any metal, although the most commonly used are alloyed steel, stainless steel, brass, aluminum, tungsten and non ferrous metals. 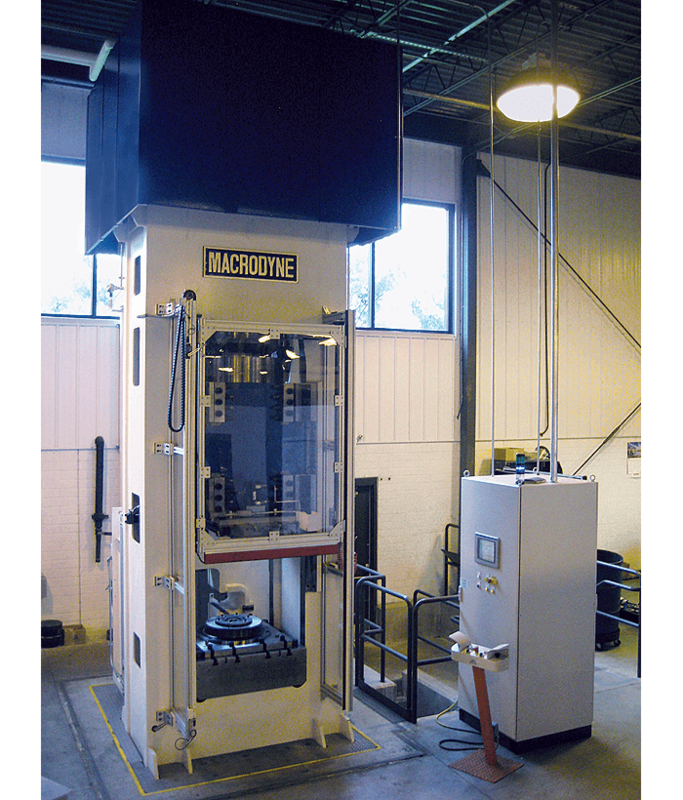 Forging presses are able to form stock metal preforms into high volumes of identical parts with a high degree of accuracy. It is a quick process that changes the shape and size, sometimes the properties, but never the volume of the metal. Scrap metal and trim are often produced. Products like car wheels, bushings, gears, automobile axles, water valves, rocket nozzles, air craft structural components and kitchen sinks are produced by a hot or cold forging press. Forging presses are alternatives to hammer and rolling forging, and uses two press rams that both move together in a linear motion and are able to produce 50 thousand tons of force at one time. Forgings produced in a press are formed one of two ways: closed die forging or open die forging. In closed die forging, the metal is trapped in recessed impressions and machined into the top and bottom dies, forming a more complicated part that isn’t flat on the bottom. Closed die forging can be performed at either hot or warm temperatures. Open die forging is the most common, and it includes processes like upsetting, punching, reaming, bending and drawing. Some forging presses don’t use any heat to form the metal into a product, just force and pressure. This is usually limited to softer metals like aluminum. Most metals are hot forged, and heated anywhere from 1000º to 2500º F. When the metals reach these temperatures, deformation is caused. The grains of the metal elongate and develop a fiber-like structure, which increases their strength. Because of this, hot forged products are stronger than other metal products and more ductile along the grain structure than across it. Forging Presses Forging presses are hydraulically powered metal forming machinery that force metal blocks to take the shape of a product by using a mold, extreme force and pressure, and sometimes heat.